Wire Harness Archives | Northpoint Technologies Inc. It may be helpful to distinguish between wire and cable before considering the difference between a wire harness and a cable assembly. While these two products are similar, there are also differences as well. Both wire and cable are designed to carry electricity from the source to a destination. Wire consists of a metallic strand that is often sheathed, whereas a cable consists of multiple wires that run together within a single sheath. Wire harnesses and cable assemblies both share a similar purpose. Both are used to bundle multiple wires or cables together to keep them organized. There are many situations where it is desirable to keep similar wires organized together, including automotive, computer, and machine applications. A wire harness is wrapper or sheath that bundles wires or cables together. The external sheath of a wire harness is typically made from a thermoset or thermoplastic material. The wire harness serves to keep the individual wires or cables organized. A cable assembly is similar to a wire harness, but features a more durable sheathing. Cable assemblies are used instead of wiring harnesses when exposure to environmental factors is a concern. The external sheathing on a cable assembly may be made from vinyl, thermoplastic rubber, or shrink wrapped thermoplastic. The more durable sheathing on a cable assembly serves to protect the cables or wires from a variety of threats like heat, abrasion, moisture, and friction. Northpoint Technologies, Inc. specializes in the engineering and fabrication of custom cable assemblies and wire harnesses. We are more than just a cable assembly company. 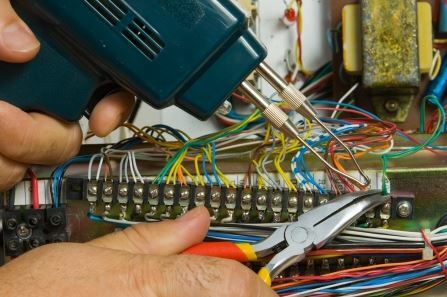 We are also experts in our customer’s wiring needs. Contact us today at 915-591-6300 to learn more about our services or to request a quote.